Federal Reserve Chairman Ben Bernanke testified before the Senate today - last week he testified before the House - and the media wanted to hear if the "good" US jobs report, which came out since he last spoke, changes anything about monetary policy. The jobs report has been deemed "good" because the headline unemployment number went down a little to 8.3%. Bernanke actually said this understates the weakness of the labor market, but do these monthly numbers matter at all? People who crunch the numbers seem to say no. David Stockman, Ronald Reagan's former budget director in an email that's been made public wrote you basically can pick and choose what you want from the reports to support your thesis but, "In short, if you spend a little time with these numbers you will know that they are being made up." John Mauldin, financial expert was writing about something similar that these numbers are subject to large revisions up or down - so take them with a grain of salt. So if that's the case and the Bureau of Labor Statistics is the emperor wearing no clothes, coming out with these meaningless numbers each month, why are markets and the media glued to them? We will be speaking with Nomi Prins during the show, and will ask her what she things about this purported oddity of markets hanging on news that the may see as highly dubious. And speaking of news the markets and media hang on - Greek leaders are still in talks over a debt deal - and the markets are doing their usual finger-biting as they wait for some "resolution." 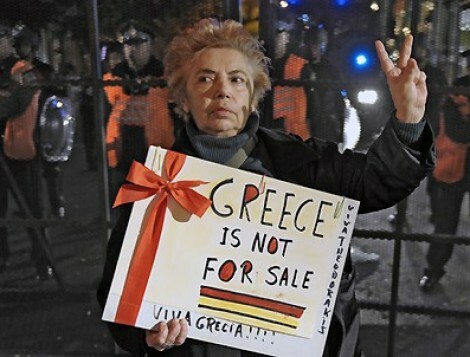 The Greek government and its Troika "partners" did agree to some more cuts to public workers, but forget the market and look at the reaction on the streets of Greece. Scenes of protesters burning the German flag, chanting "out with the nazis." So how long will Greeks continue to bear the weight of austerity with no light at the end of the tunnel, and bear policies being pushed by people they don't know, working together with politicians they don't trust? Again, we will ask Nomi Prins what she thinks about this, and if she believes that these policies are there to help the people or to help the creditors, and by extension the banks. And in the US 40 states have signed onto a $25 billion dollar settlement with the five biggest banks guilty of foreclosure abuses such as 'robo signing' of documents -- but who would this provide relief to, homeowners? Or big banks. We speak about all of this with Nomi Prins, author of "Black Tuesday" and a former managing director of Goldman Sachs. Plus, is US President Barack Obama a hypocrite for backtracking on Super PAC money (now he wants it) and is the US exerting "extra--territoriality" with regulations on financial markets? With Demetri out sick, the Alyona Show's Alyona Minkovski joins Lauren and Shannon to give her two cents in Loose Change.